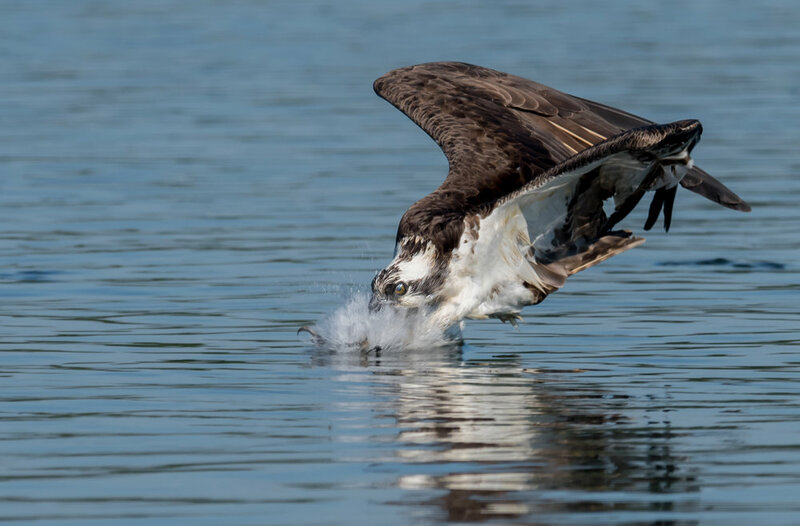 Below are some of my favorite "bird in flight" images that I have and the stories behind them. 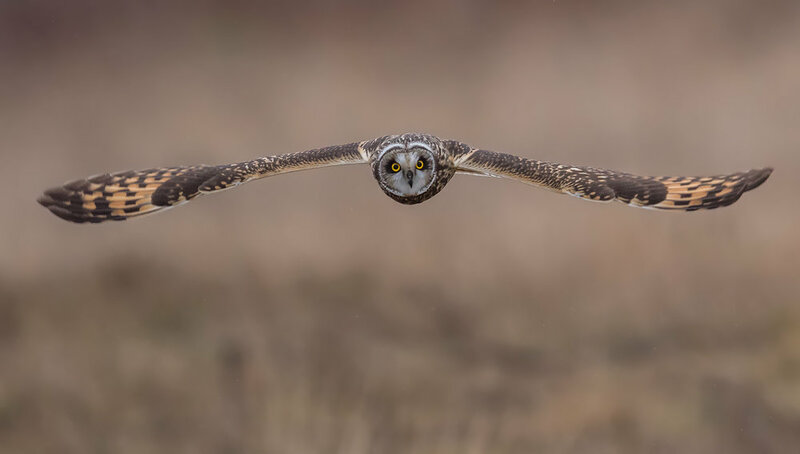 This great gray owl image is my all time favorite photo that I have taken. This picture won the People's Choice Award in the 2017 National Geographic Nature Photographer of the Year contest and has been published worldwide. I made the 7 hour trip from my home to New Hampshire where this owl was located on a day when temperatures were close to -20F degrees with the strong winds. I had been photographing this owl from a distance when it began its evening hunt. The owl took flight and landed on a post that was only a few feet from me. Being that I was shooting with a 600mm lens I had to quickly back up as the owl was too close. While I was in the process of relocating, the owl spotted a vole in the grass below it and attacked. I rushed to get set up just in time to capture the tail end of the owl's attack. The first few frames were out of focus as I had not fully set up yet, but luckily this photo was one of the few that turned out perfectly! Camera settings: Nikon D5 & 600mm f4 VR lens: Manual Mode: 1/2500, f5.6, ISO 1250. This image is of a burrowing owl in Cape Coral, FL. While this image may not be the most impressive photo to some, it is actually one of the more difficult that I have taken. Burrowing owls are very small and very fast, coupled with one flying directly at me made it very difficult for the camera to track and keep it in focus. After fighting with this for a while I tried a new approach. Instead of trying to track the owl flying through its entire path, I picked a small area where I wanted the owl to be and focused on that. Once the owl approached that area, I then engaged the autofocus on the camera using 9 autofocus points and was able to nail this shot finally! Camera settings: Nikon D5 & 600mm f4 VR lens: Manual Mode: 1/3200, f8, ISO 1000. 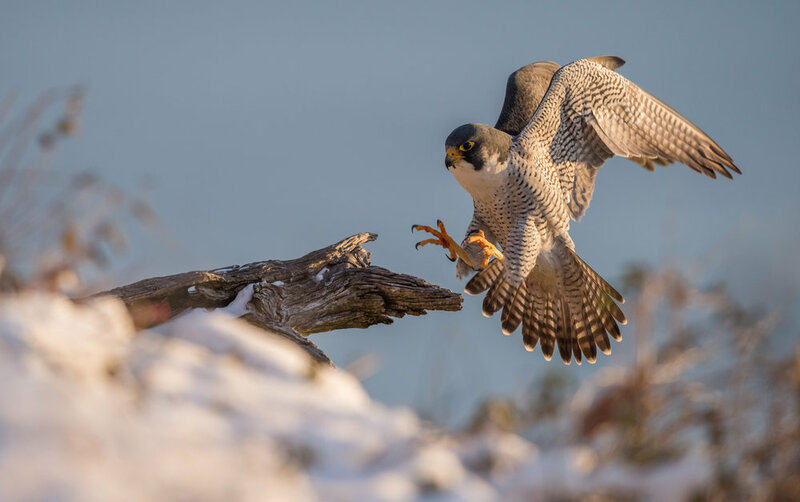 This image is of a peregrine falcon landing on snowy cold morning in New Jersey. The falcons at this location hang out on the cliffs at 500 feet above the Hudson River. Often when the falcons come in to land, they approach from underneath this branch which is not visible from the angle I took this photo. In order to get this one, I set my camera up on manual focus and pre focused on the end of the tree branch. Using a wireless remote I was able to stand 75-100 feet away from the camera where I had a clear view of the falcon's flight path. Once the bird was close to landing I simply hit the remote shutter and the rest is history. Camera settings: Nikon D800e & 600mm f4 VR lens: Manual Mode: 1/1600, f5.6, ISO 1600. While on a trip in 2017 to Machias Seal Island off the coast of Maine with another very talented photographer and one of my best friends Ray Yeager (https://www.facebook.com/RTYPhotography) I was able to get this photo of an Atlantic Puffin retuning to feed its chick with a mouthful of sand eels. Puffins are another small, fast bird and getting this photo was challenging as well. Luckily this particular puffin flew in very close with a slower approach. For this photo I used 9 focus points again and a fast shutter speed (1/5000) f7.1, ISO 800 on a Nikon D810 and 200-400mmf4 VR-II. In 2017 my wife surprised me with a trip to Seattle. Having never been there I took a chance on a location in NW Washington a little over an hour from the city that I read online was a good spot to see harriers and owls. After about an hour of searching with little luck and fading light we were about to quit. I decided to do one more pass through and good thing I did, we finally spotted an owl flying in a field. It wasn't long before there were so many owls around that I didn't know where to look! The best part was that there was no one else around but us. That does not happen often where I usually shoot. This photo was taken as the sun was setting and a light rain had started. Camera settings: Nikon D810 & 600mm f4 VR lens: Manual Mode: 1/1600, f4, ISO 3200. This is an image of a snowy owl that was taken in New Jersey in 2017. The owl had been sitting on this post prior to this moment. Unfortunately there was a man with a cell phone trying to take photos of the owl and he was getting too close forcing the bird to keep flying away from him. Finally a park ranger arrived and while in the process of making the man leave, the owl took flight. I fired away taking many photos but this was my favorite of the series because I liked the way the eye is seen through the primary feathers. The lighting was very harsh as this was mid day on a sunny day but sometimes I can overlook that for a moment like this. Camera settings: Nikon D5 & 600mm f4 VR lens: Manual Mode: 1/3200, f7.1, ISO 400. This image of a razorbill was taken on Machias Seal Island on the same trip that I took the photo of the puffin. The story isn't much different about this photo. Razorbills also nest on the island alongside the puffins and resemble penguins other than the obvious, that they can fly. I loved the straight on approach that the bird had with its wings spread. Camera settings: 1/4000, f7.1, ISO 800 on a Nikon D810 and 200-400mmf4 VR-II. 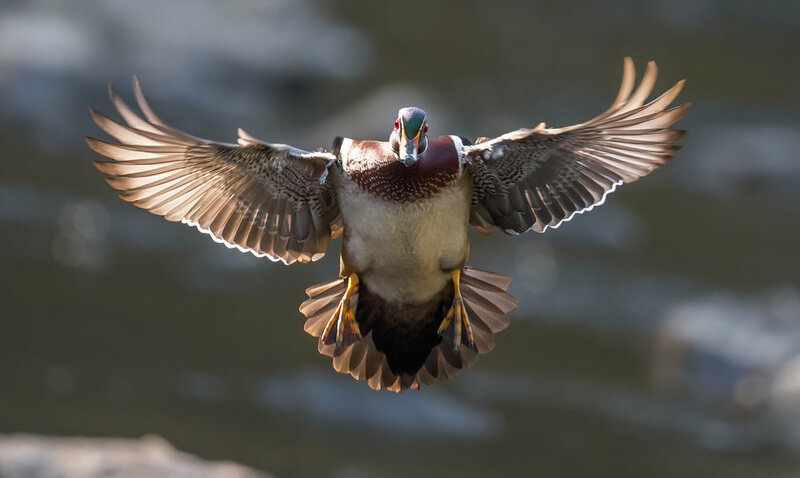 I have been photographing these wood ducks in Pennsylvania for several years but until this year I had never bothered to try for flight shots. Normally I am set up sitting in the water with my camera just above the water's surface which makes it very difficult to track these ducks in flight. 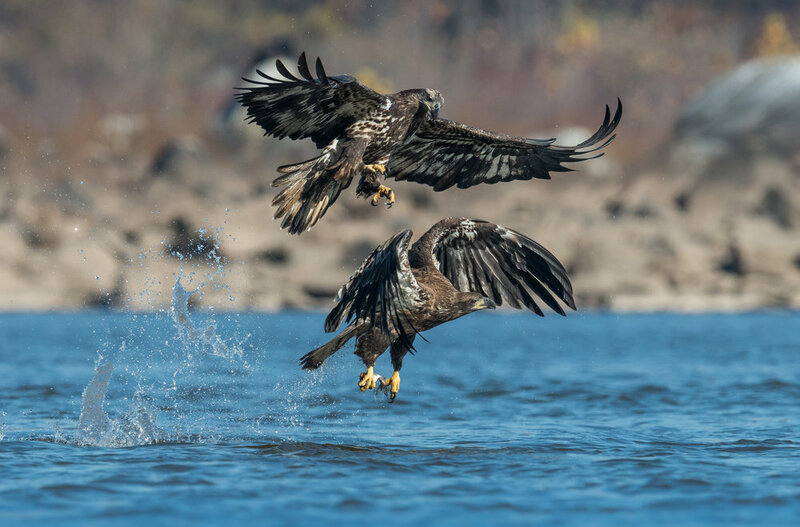 They are very fast and don't often provide good opportunities for flight shots. On this day I decided I would change that and forced myself to spend the day only tracking them in flight. After a while one male duck finally cooperated for me producing this image. I used a single autofocus point as there are many trees in the background that often will force the camera's focus off of the bird when using several focus points. Camera settings: Nikon D5 & 600mm f4 VR lens: Manual Mode: 1/2500, f7.1, ISO 2500.